The largest biodiesel production facility in the United States-Imperium Renewables' 100 million-gallon-a-year plant in Grays Harbor, Washington-is now up and operating, ready to meet the fast-growing demand for biodiesel. Rudolf Diesel, the inventor of the diesel engine, had hoped his engine would provide power using alternative, and less expensive, greener fuels. As early as 1913, Diesel was quoted as saying: "The use of vegetable oils for engine fuels may seem insignificant today. But such oils may become in the course of time as important as petroleum and the coal tar products of the present time." This past summer, Rudolf Diesel would have been amazed at how prophetic his words would turn out to be. That's when Seattle-based Imperium Renewables officially opened the largest biodiesel production facility in the United States at the Port of Grays Harbor in Hoquiam, Washington. 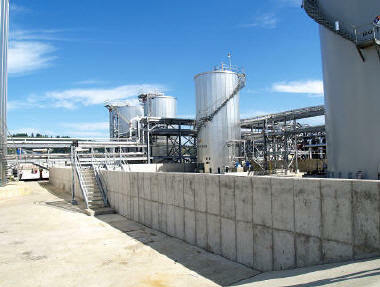 It has the capacity to produce 100 million gallons a year, and to store 17 million gallons of biodiesel and feedstock on site. The facility, located on 12 acres, is enormous in both scale and vision. The two million-gallon, carbon steel tanks are supported by three-and-a-half foot thick concrete foundations, each totaling 1,000 cubic yards of concrete, supported by 185 piles driven 75 feet into the ground. The equipment is connected through more than 70,000 linear feet of piping. Over a million pounds of structural steel went into the project. And there are 79 pumps in all, ranging from 1/2 horsepower sump pumps to 250 horsepower pumps capable of moving 3,600 gallons per minute. But possibly more staggering is the fact that general contractor, J. H. Kelly Inc., constructed the facility from start to finish in nine months. "The launch of Grays Harbor represents a coming of age for the biodiesel industry," says John Plaza, founder and president of Imperium Renewables. 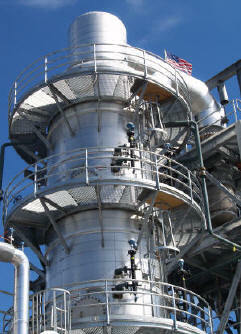 "This facility has the scale and the systems to produce fuel comparable to petroleum diesel that meets ASTM standards. The difference is that our fuel has far less impact on our environment than fossil fuels, and is made from renewable resources." The primary feedstock for the plant, at least in the short term, will be canola oil out of Canada. But the facility is capable of not only processing different feedstocks, but is also able to process them simultaneously. The most common types of oil used for biodiesel production are soybean oil, canola oil or palm oil. But because the facility is multi-feedstock, they are already looking ahead at future feedstocks, such as algae and a plant called jatropha, which both show promise and have a high oil content. Imperium Renewables is focused on securing feedstock because they have invested heavily in meeting the growing need for biodiesel. But judging by the statistics, it's a safe bet. In 2004, Americans used 24 million gallons of biodiesel, but in 2005 they used 75 million gallons and by 2006 they were up to 250 million. That's a tenfold increase in consumption in only two years.
. It has 78 percent fewer carbon dioxide emissions than petroleum diesel.
. The ozone forming potential of biodiesel hydrocarbons is 50 percent less than that measured for petroleum diesel. Sid Watts, Imperium's general manager, says their process at the core is similar to other facilities. "The process, transesterification, is basically taking any triglyceride, vegetable or animal oil, reacting it with methanol in the presence of a catalyst, which in our case is caustic, and what you get is methanol esters, which is biodiesel and glycerin." The primary feedstock for the Imperium Renewables plant, at least in the short term, will be canola oil. But the facility is not only capable of processing different feedstocks, it can also process them simultaneously. It's at this point, though, that Imperium separates itself from the pack. They have incorporated proprietary technology that makes them truly state-of-the-art. "Most biodiesel manufacturers in the U.S. are using what we call 'wet technology'," explains Watts. "Once they get the biodiesel, most people let it decant. Basically they put the reacted product into a large tank and the denser glycerin settles to the bottom and the lighter biodiesel settles at the top. Even though the glycerin and biodiesel have a very strong tendency to separate, there is always a trace amount of glycerin and methanol still left in that biodiesel. "And in order to be ASTM spec, you've got to get the rest of that material out. 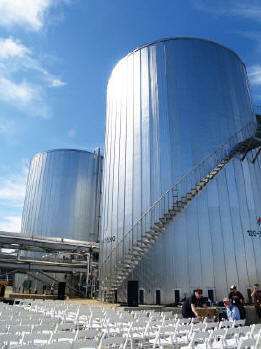 And the way that most of the biodiesel manufacturers in the U.S. do that is that they introduce water after decanting." The problem with the technology is that although the water cleans out the contaminants, water itself is also a biodiesel contaminant. An extra step has to be taken to remove the water. "Imperium uses a 'dry process'," explains Watts. First, the company monitors very closely all the incoming feedstock and methane to ensure low water content. Then after decanting, they put the biodiesel through a flash system. "We heat the biodiesel up with heat exchangers and then spray it into large flash tanks. That will flash off any of the methanol that's remaining in the biodiesel." 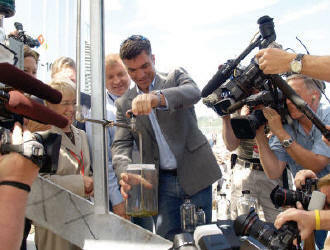 Martin Tobias (above), CEO of Imperium Renewables, fills a container with the very first biodiesel processed from the Grays Harbor plant at the official opening ceremony this past summer. The next step is distillation. "That does two things," says Watts. "It removes any other remaining glycerides in the biodiesel and it also allows us to control the gel point-one of the big issues with biodiesel. In other words, the distillation helps us to control the 'cold flow' properties of the biodiesel and we can separate the biodiesel into different molecular weights and products that will gel at different temperatures." In September, Imperium was still testing and making final modifications to the distillation tank, with full operation expected in early October. There are several tests that can evaluate the gel point. The most common Watts says is called the CFPP (cold filter plug point). This is a critical evaluation because it basically indicates at what temperature the biodiesel will start gelling up a fuel filter. "Petroleum diesel generally gels below freezing. With biodiesel that varies, depending on the feedstock being used," explains Watts. "Palm CFPP can be as high as 60 degrees fahrenheit. Soybean can be in the mid 30's. And the canola can be well below freezing. Our distillation step is advantageous because Imperium can actually separate no matter what feedstock we're using." Determining the gel points determines the customer Imperium will be selling to. The lower gel points (canola oil) are sold to the automotive and consumer markets. The higher gel points (palm and soybean oil) are sold to industrial customers. Already a cruise ship line has placed an order. They, like many industrial users, have heated fuel tanks so they can process the biodiesel with higher plug points. The Imperium Renewables facility (right, at the official opening of the plant) is enormous in both scale and vision. The two-million-gallon, carbon steel tanks are supported by three-and-a-half foot thick concrete foundations, each totaling 1,000 cubic yards of concrete, supported by 185 piles driven 75 feet into the ground. "Being able to control that production is a huge advantage for us," says Watts. "And the remaining glycerin is also sold. It can be used as an off-grade fuel." It can also be refined and cleaned up, and used in the manufacture of other products, such as cosmetics, he adds. An additional selling point for biodiesel is that many environmental hazards and dangers are virtually eliminated. "Because we take the flash point of the biodiesel up so high, it's not considered flammable material," says Watts. "And biodiesel isn't toxic. It biodegrades. It smells and looks just like the vegetable oil that's in your cupboard. We've just removed the glycerin. If you were going to get in an accident and biodiesel spills on the road, it's not a hazardous material type spill." The biggest challenge for Imperium now will be coordinating the shipments in and out to be able to take advantage of their 100 million-gallon capacity. The reason the company picked Grays Harbor as a location is the tri-modal transportation aspect, says Watts. "We're going to be getting ships, barges, trains and trucks. And that is all available here." Imperium added nearly a mile of new track and carried out extensive upgrades to the Port's existing rail line and utility infrastructure. The rail yard consists of four parallel tracks capable of accommodating a 90-car train, and has a separate track dedicated for unloading process chemicals. It is also designed to provide full containment in the event of a spill. Imperium Renewables is a lot of things-but one thing they want people to know they are not is ethanol. "We're a very different animal," says Watts. "Biodiesel is much more energy efficient, and we do not use corn oil. I'm continually asked, 'How much corn oil are you using?' And that's not us at all." The future seems bright for Imperium, which started up only a few years ago. In 2004, it was a five million-gallon production facility in Seattle. And although they are successfully ramping up 20-fold in Grays Harbor, the company's hopes are to ramp-up even further with large facilities planned in Hawaii, Pennsylvania and Argentina. The one thing they don't have to be concerned about is a continued and growing need for biodiesel. "The interest in biodiesel is phenomenal," says Watts. American consumers and industries are only now starting to see the biodiesel benefits Europeans have experienced for over a decade. It's too bad Rudolph Diesel isn't here to see it.